Determining the value of Breyer horses and indeed of any horse model differs from other collectibles. Action figure collectors, for example, set a high value on figures still sealed in their original packaging, while model horse collectors generally don't care if a model is in the original package or not. Someone who collects porcelain plates may not care if there's a tiny chip in the rim if the hand-painted center is pristine; to a model horse collector, a chip can detract so much from the value of a model that it becomes virtually worthless. So where do you begin to determine the value of your Breyer horses? It's critical to know the specifics about the particular Breyer horse in question. What do you know about your model? Mold: The mold of a Breyer horse is the shape of the horse. It refers to the mold used to form the plastic horse model. Breyer uses a mold over and over again and issues the same mold in a variety of colors. Collectors often refer to the mold as shorthand for any Breyer horse released no matter what the color. They may say, "I have a Proud Arabian Mare," referring to a favorite mold sculpted by Maureen Love Calvert and introduced in 1956. Model: The model name, on the other hand, is a given name for a specific mold and color. 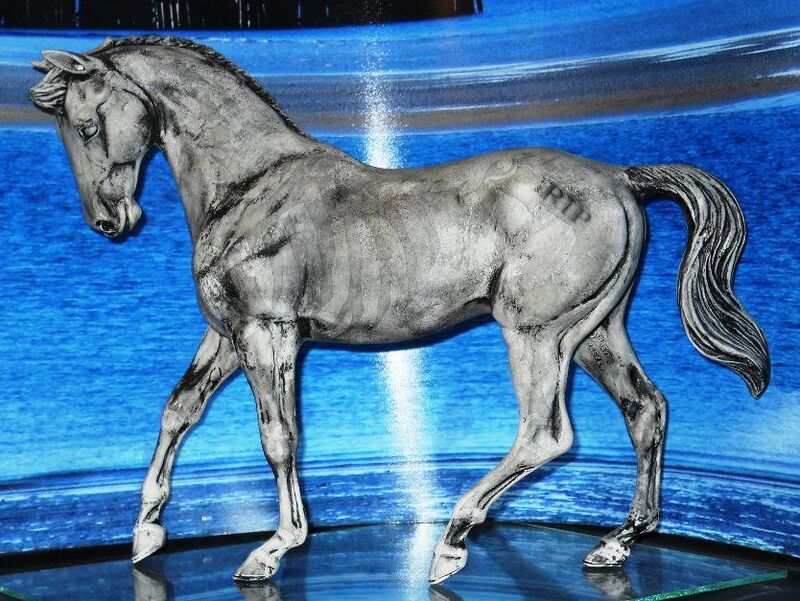 For example, the original Proud Arabian Mare (the mold) was released under the name "Pride." Pride is her model name, while Proud Arabian Mare is the name of the mold. Subsequent models made with this mold are either referred to by their color or by other model names, such as Karma Gypsy, released in 1996. Issue Number: Each mold and model also receives a number, which is listed in the dealer and customer catalogs. Color: Model horse colors are roughly equivalent to actual horse colors with a few exceptions. Horses are released in basic colors such as bay, gray, or black. Certain colors, however, are called fantasy colors. Wedgewood blue (misspelled by collectors so much so that the cornflower-blue color from the famous pottery is now called Wedgewood when it's applied to model horses), gold charm, alabaster, and other colors are never found in nature but often found on model horses. Size: Breyer horses follow a unique scale convention that does not translate easily to the dollhouse, train or military models. Traditional scale models are approximately 9 to 12" tall, but ponies and foals are sized in reference to the adult and larger breed horses in the scale such as draft horses, so may be slightly smaller. The traditional scale is roughly 1:9 or 1:8. The next smaller scale is Classic, with models in the 1:12 scale; Paddock Pals (sometimes referred to by the older name Little Bits) are 1:20; and Stablemate models, which top out around 2" tall at the ear tips and are in 1:32 scale. Mini Whinnies, also called micro minis, are 1" tall or smaller. Look at the model you're trying to identify. What can you ascertain at first glance? The size, certainly, and the color. You can also look underneath to see if it's a boy or girl; yes, Breyer horses are anatomically correct! Now that you have a list of obvious characteristics, it's time to start hunting through a good collector's guide or the many identification websites. The Breyer Animal Collector's Guide by Felicia Browell, Kelly Korber-Weimer, and Kelly Kesicki identifies most major Breyer models with clear photographs and details that will help you pinpoint your model and its value. Identify Your Breyer provides photographs and information on many Breyer models. Once you've correctly identified the mold, model, and color, you can figure out the base value of the model from the collector guidebooks, websites, or a glance through an auction website. Scratches, rubs, and breaks reduce a model's value considerably, more so for common models than for rare models. A rare model, for example, such as a Woodgrain Family Arabian Mare is worth over $1,800. A palomino colored Family Arabian Stallion produced that same year is probably worth only around $20. If both models had chipped ears and rubs on the flanks from children playing with them, the Woodgrain family mare might lose only about 5% of her value, but the Family Arabian Stallion would be worth only a few dollars. Rarity, in this case, drives price. Having or not having the original box or packaging material doesn't change the model's value, so don't pay more for models touted as still in the original box. Ditto for signed, autographed models; unless you're a huge fan of whoever autographed the Breyer horse, the signature doesn't add value. Breyer models are hand painted, so you'll often see variation in things such as the spots on an Appaloosa horse, the amount of white on a blaze, and the details on the eyes. These things may or may not affect the value. If it's unusual, collectors may be willing to pay a few more dollars, but for the most part, they're just viewed as oddities. Valuing a Breyer horse takes time and patience. Don your deerstalker cap a la Sherlock Holmes, pick up a good collector's guide and start your search to get an idea of the value of your collectible.